Lights, Camera, Action! We’ll keep your audience focused. Whether it’s your own YouTube Channel, video on your website or a video loop at your trade show booth. YouTube is the second most popular search engine, & web pagescontaining videos experience more than a 157% increase in organic traffic. By 2019, videos will account for 85% of online traffic in the US. There is no better way to present your company’s products or services than with a professionally produced video. Music, voice overs, animation, video, there is no limit. YouTube is the second most popular search engine, & web pages containing videos experience more than a 157% increase in organic traffic. By 2019, videos will account for 85% of online traffic in the US. Half of the consumers who watch online product videos say it helps them make more confident purchasing decisions. Studies that 74% of users who watched an explainer- video about a product subsequently bought it. People who watch videos stay on a site two minutes longer on average and are 64% more likely to make a purchase. A video by itself is 50 times more likely to appear on the first page of Google than traditional web pages. 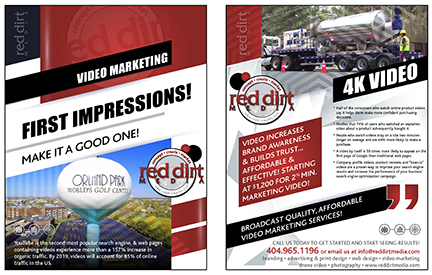 DOWNLOAD OUR VIDEO MARKETING OFFER!